We are more than happy to announce that we joined another cryptocurrency exchange. From now on, you can trade FTO with South Korean won (KRW) on Coinchel Cubes. We wanted to finish the first year of our activity on a high note. We entered DFEX, a Malaysian crypto exchange. Now, we are also enlisted on another Asian platform – Coinchel Cubes. We still want to grow and expand our offer to crypto traders all over the world. Since the only way to reach new clients is to get enlisted on new platforms, we decided to join Coinchel. Coinchel Cubes is a breath of fresh air in the cryptocurrency industry. The platform is a global exchange headquartered in South Korea. The exchange started to operate almost a year ago in Seoul. The company cooperates with many foreign corporations and has its departments in Korea and the Philippines. Coinchel works not only online, but also offers its services offline. There are four offices in Korea, where every client can operate on exchange with the support of platform assistants. Coinchel Cubes is in a small group of exchanges in the Asian country that directly accept fiat currency to buy cryptocurrencies. The exchange is one of the most secure platforms in the world. Coinchel has four levels of authentication methods. It increases the amount a user can deposit or withdraw at a given time. 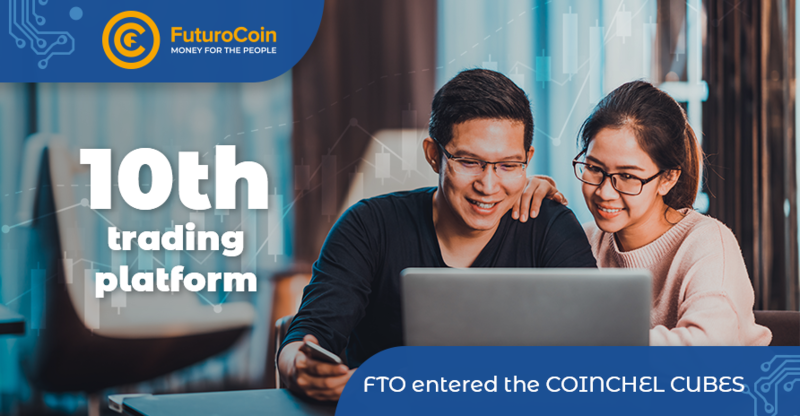 FuturoCoin is paired on Coinchel Cubes with South Korean won on FTO/KRW market.